Gaza health officials claim one man shot and killed during violent riots along southern edge of Israel-Gaza border - 33rd fatality in riots. A rioter was shot and killed during a violent protest on the Israel-Gaza border Thursday evening, health officials in the Gaza Strip claimed. Officials in the Hamas-ruled Gaza Strip identified the man as 28-year-old Abdullah al-Shahari, a resident of the Gaza Strip who was reportedly shot and killed during a demonstration outside of Khan Yunis in the southern Gaza Strip. According to AFP, IDF officials could not confirm the incident. If verified, the latest death would raise the total number of fatalities in the riots at 33. 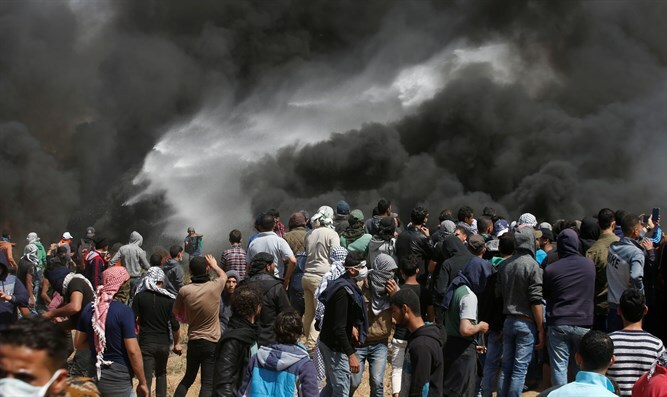 Beginning on March 30th, thousands of demonstrators have gathered along the security fence separating Israel from the Gaza Strip, hurling firebombs and burning tires at Israeli security personnel. Terrorists operating along the border have also launched a number of attempted terror attacks, using the ongoing demonstrations as cover. The protests are slated to last for six weeks, culminating each Friday in larger demonstrations and ending with a mass protest against the establishment of the State of Israel on May 15th, one day after Israel’s 70th Independence Day and the opening of the new US embassy in Jerusalem. Of the 33 Gazans killed since March 30th, 14 have been identified by Israeli security forces as Hamas terrorists, including Yasser Murtaja, purportedly a photo journalist, who had used a drone aircraft to gather intelligence for Hamas.